Family Volley: Is There A New Baby In Your Future? Are Your Kids Jealous? Is There A New Baby In Your Future? Are Your Kids Jealous? I know a lot of families who are expecting new babies in the next few months. There are also a lot of you who either just had babies or are due before Christmas. Congratulations, belated and in advance. There is no way to adequately describe having a newborn in the home. It is humbling and thrilling. It can also be hard on older siblings who feel their world has just been turned upside down. A sense of jealousy, resentment, and even a little anger is normal. Siblings are worried there won't be enough love for them with a new baby around. This is one of my favorite pictures. Ever. There are a few things that you can do to help create a smoother transition for your family and your new bundle of joy. Talk to your children about why they will be such great big sisters and brothers. Be realistic. Getting your son excited about things the baby can't do until he is 4 will create false hopes. It is obvious to you and your spouse that things will change when the baby comes. Around your other children, try to emphasis what will stay the same. This will give your children a sense of security. Remember, children like predictability. If they think the new baby will make everything "different" they won't be very excited for the new addition. These can be little decisions like paint colors for the nursery, new clothes to hang in the closet, or what pictures to put on the wall. You can even have your children create artwork and then frame it for the babies room. I have a few friends who let their kids help choose the baby's name. One family I know let their kids choose the middle name of the new baby. 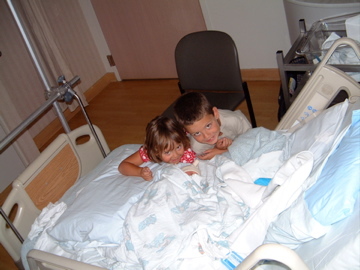 What ever it is, involve siblings in making meaningful decisions when preparing for the baby. When kids make decisions, they feel ownership and they feel included. Want a fun way to include your children when you have a new baby? Give each of them their own disposable camera and ask them to be the photographers. They will feel important and have fun taking pictures at the hospital and when you bring the baby home. When you develop the pictures you never know what you will find. Naturally you will be excited for your new addition but cootchy-cooing all. the. time when older siblings are around will make them feel left out. Not to mention, they will start to resent the new baby. Be sure you continue to pay attention to your other children and ask grandparents, friends and family to do the same. When we had our third baby, a good friend stopped by with dinner and to see the baby. She also brought little treats for our other two children. It was such a nice gesture and made them feel special. She congratulated them on being new "big siblings." It was really nice to see them feel special. Remember kids and predictability? Still applicable. If the new baby changes your normal routine too much, your older kids will feel the new baby is "cramping their style." Try to keep things after the baby, similar to how they were before the baby. Take a minute and think about what activities and parts of the day mean the most to each of your children. Do all in your power to not change those important things. 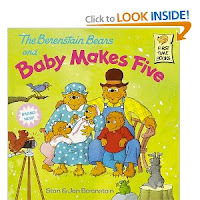 Have them sing to the baby, read stories, choose outfits, and help pack the diaper bag. 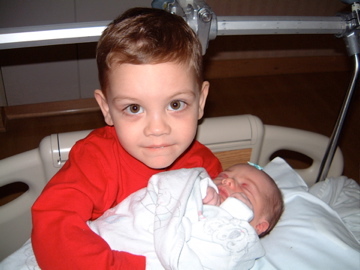 When we had our second, our son was just 2 1/2. Anywhere I went with the baby, I invited him along. He stood by me when I bathed her, dressed her, he sat next to me and read stories when I fed her. He helped me do everything. His favorite, slowly pouring warm water on her feet when she was taking a bath. There are so many things that kids can do to help. Let them in. Don't make the baby off limits to your older kids. One of the best ways to make the transition smoother, spend time with each child individually. This sounds obvious, but when we are tired, baby tired, it can slip our minds. Do what ever needs to be done to give individual attention. At home, take time to show them pictures of when they were young. Watch home videos of when they were babies. Talk about how cute they were and special it was when they came home. Grab ice cream together and talk, go to the bookstore, play catch. Anything special and together. Think about how you can prepare older siblings before the baby arrives. So when your mind has been over taken by hormones you will be ready. Do you have a child who is jealous of a new baby? Then this is a good read. DO YOU HAVE A BABY ON THE WAY? HAVE ANY OF YOUR CHILDREN STRUGGLED WITH NEW BABY JEALOUSY? I'm stopping in from This or That. I already follow with GFC, but now I follow on twitter and I voted for you on Top Mommy Blogs too. I just had my third child and love your tips! We had to be careful with Asher when Abbie was born. He was only 16 months and so it was hard to explain what was going on. Looking back, I wish that we would have done more to help him transition. It went from just being us, to having a screaming, wiggling thing move in. I think it affected him, and made his terrible two's a little worse. Hopefully as they both get older, things will get better. Couldnt find your GFC gadget, but I am following with my reader. I just brought home baby #3 in March. My 6 year old was thrilled, and still can't get enough of her. My 3 year old, not so much. I've had to find extra time to spend with him and make sure I'm super sensitive (that if he needs something while I'm changing a diaper or nursing that I canNOT say wait until I'm finished with the baby, or that sets him off). But it's gone much better than I expected, that's for sure. When baby #2 came baby #1 wasn't jealous really at all. He handled it well, but when baby #3 came we prepared #2 the same as we had done previously with #1. #2 didn't take to it as well, and was jealous. #1 loved the baby from in the womb and was so excited to take him home. We found telling #2 he was being such a good big brother when he did anything (even just snuggling mommy without pushing the baby away), and he got proud of himself. He now loves his baby brother so much! You've got some great pictures there! I'll keep this in mind if we ever decide to have another little one :) The one we've been blessed with is quite a handful all on her own! This couldn't be more timely as I am just a month away from #3 boy coming and I am very unsure of how the older two will handle it. The transition from 1 to 2 was rather difficult and I just pray they can help each other out this time around! Thanks for such great suggestions. 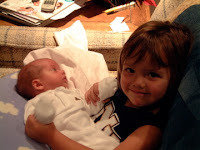 I just might have to try the camera one and keep in the forefront of my mind that they will each need mom time. But what do you do if you don't like the name they picked for baby for a first or middle name? Shannon, Congratulations on the new baby. The home stretch. As far as names go. We talk to our kids about names, but don't let them name the new baby. If I was going to give my kids more power over the name, this is how my husband and I would handle things. We would come up with 2 or 3 names that we liked, and then let the kids choose from those names. That way we were in a win win situation. It is the same tactic I use when my kids want to dress themselves. We put on their pants, and then get to choose from a few different shirts. Good luck. Let us know when your little one arrives.